The Earth - where is it, exactly? In the words of the late Douglas Adams (1952-2001), The Hitchhiker's Guide to the Galaxy tells us that "Space is really, really BIG.... you might think its a long way down the street to the chemist, but that's just peanuts compared to space!" 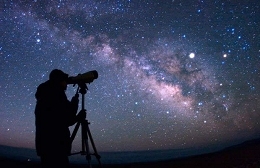 Yes, the vastness of space does seem mindbogglingly huge to us mere mortals who, he goes on to advise, inhabit a small, insignificant blue green planet, circling a star we call the Sun, in an unfashionable outer spiral arm of a galaxy known as the Milky Way. Light travels at the fastest speed known to man, at almost 300 million metres per second, 671 million miles per hour or 5,878,630 million miles per year - referred to as a 'light year'. I am pointing this out because space is so vast that beyond our own solar system we measure distances in light years. It takes 8.3 minutes for light from our sun to reach the earth - and from our moon, a little over 1 second. Now to get some idea of scale, our galaxy contains billions of other stars like our sun and the diameter of our galaxy is over 100,000 light years across. These figures seem pretty awesome until we peer further into the depths of the cosmos where, thanks to Hubbell Telescope in orbit around the earth, we can now see what parts of the universe looked like many millions of years ago, because that's how long it took some of the images we see to reach us. And what do we see? not millions, but billions of other galaxies of various shapes and sizes, expanding away from a central point in space where, scientists believe, everything got started about 18 billion years ago. This is called the 'Big Bang' theory. 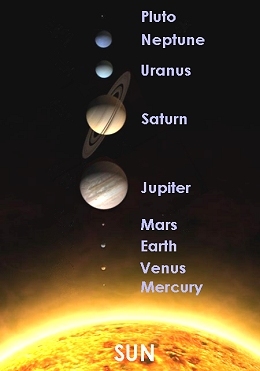 In our solar system (a collection of planets held in orbit by the gravitational pull of our sun at the centre) each planet orbits at a significantly different distance from the sun, so the danger of them ever ever colliding is negligible. It is believed, however, that near to the earth's current orbit, two planets smaller than earth, made up of mainly iron and rock, shared similar orbits and eventually did collide about 4.5 billion years ago. 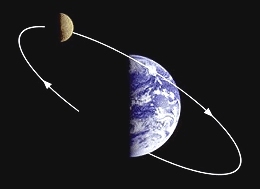 The resulting debris eventually coalesced into one single planet - the EARTH - along with an unusually large moon, the diameter of which is roughly 1/4 of the earth's own diameter. It then took the next billion years or so for it to cool whilst conditions settled sufficiently for an atmosphere to form and for it to collect enough water from comets attracted by its gravitational pull to make up the first lakes and oceans conducive to the emergence of life. The earth rotates once every 24 hours on an axis tilted at 23.5 degrees from vertical to the plane of its own orbit around the sun. It takes the moon 27.3 days to complete a single orbit around the earth, 1 year for the earth to orbit the sun and 226 million years for our solar system to complete one lap around the Milky Way's galactic nucleus. In an amusing, yet informative sketch from Monty Python's 'The Meaning of Life', Eric Idle steps out of a refrigerator into Mrs Bown's kitchen, to take her on a tour of the universe. Below is the transcript of his accompanying song. And people are stupid, obnoxious or daft and you feel that you've had quite enough! Just remember that you're standing on a planet that's evolving, revolving at nine hundred miles an hour. It's orbiting at ninety miles a second, so its reckoned, a sun that is the source of all our power. The sun and you and me and all the stars that we can see, are moving at a million miles a day. 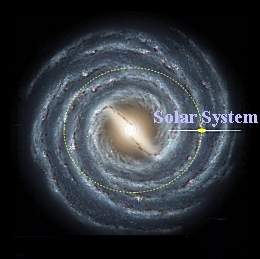 In an outer spiral arm at forty thousand miles an hour, of the galaxy we call the Milky Way. 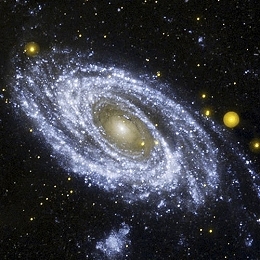 Our galaxy itself contains a hundred billion stars, its a hundred thousand light years side to side. It bulges in the middle sixteen thousand light years thick but out by us its just three thousand light years wide. We are thirty thousand light years from galactic central point, we go round every two hundred million years. 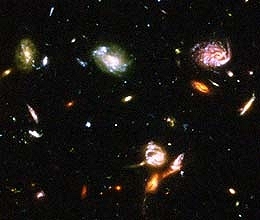 The universe itself keeps on expanding and expanding in all of the directions it can whiz. And pray that there's inteligent life somewhere up in space, because there's b***** all down here on earth!